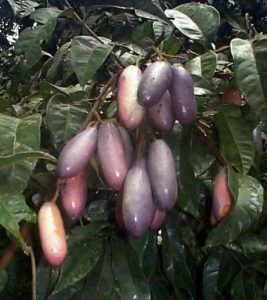 Dacryodes edulis is a medium-sized, evergreen tree attaining a height of 18-40 m in the forest but not exceeding 12 m in plantations. It is generally branched from low down, with a deep, dense crown. The bole is rather short, slightly fluted, 50-170 cm in diameter and more or less sinuous. The scented, pale grey, rough bark exudes a whitish resin. Buttresses are absent. Leaves compound, imparipinnate, with 5-8 pairs of leaflets; glossy above, pubescent, the pubescence disappearing with age. Read more.